How to get the best flight deal? 10 Do’s and Don’ts. This is probably one of the most important steps of your trip – to find the best flight deal. Flights are one the most expensive things of your travel budget however you can save a lot of money with the tricks that I describe below. Patience will be necessary but trust me when I say that will be worth it! 1. ALWAYS use “incognito” mode of your browser! That’s the first rule. Before you start the search make sure you are in the incognito mode of you browser. 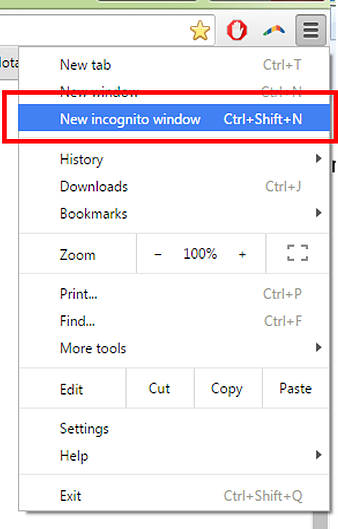 If you are using google chrome just open a new window (see the image below). Websites regularly record your search and if you try to find the same flight two days later you will probably notice that it became more expensive! This is a way to make you book your flight as soon as possible because the longer you wait the more expensive it will get (at least to your eyes). Incognito mode will avoid this exploit. The fact is that fares can change according to your location, for example it can happen that someone looking for a flight in Poland will get a different price from someone else that is in Portugal (I tried it and in fact the prices were different). The only thing that you have to do is to change your IP address location. This might seem complicated but it’s not. I’m not an IT expert and I have done it, so I’m sure you will be able to do it as well. I use SAFERVPN (trial version) and it’s really easy work with. You can watch the tutorial about how to change your IP address with this SAFERVPN here. Try to change your IP to the country where you are travelling to and check if you can get different fares. Be aware that you will probably pay in another currency so don’t forget to read the number 9 of this post. Most of the big cities have more than one airport, which can be a huge advantage. Search for flights to those airports too. Go.travelpn is a nice tool to look for the list of airports close to a selected city of your choice. If you decide to fly to a different airport check the cost of the transfers to reach the city. It’s not common but it can happen that the cost of the flight plus the transfer will be more expensive, so just have a look on the price of the transfer before you book your flight. Of course this will depend on how much time you have to travel between one place to another but the fact is that using a connection flight can be much cheaper than using a direct flight. To check the connections between your departure location and your destination you can use one of the common meta search websites such as Skyscanner, Momondo and ITA Matrix. I always also check the software azuon. You can read more about those search engines in my next post, coming soon. If you decide to do a connection flight make sure that you will have enough time between both flight. My recommendation for the layover time is to save at least 1h30 for domestic flights or in the Schengen area and at least 2h-2h30 for the rest. In some connection flights you will need to go through the passport control. Take into consideration that taking your electronic passport (even if you only need you ID) can save you a lot of time because you will be able to use the “fast lanes” of passport control and avoid the “loooong queue” in the normal crossing points. I don’t think this will be a surprise but yes, prices can vary for each website. There are plenty of websites and softwares to help you to find the best flight. I will write a post just about this topic. Most of the times flying during specific days will increase the price so what I will suggest is to try at least to have one flight during the week or on Saturdays. One thing I can guarantee: most of the times flying on Sundays will be more expensive. Regarding the time of the flight the best deals can be found early in the morning and during lunch and dining time. 7. DON’T buy your flight ticket with so much time in advance! You probably heard that “the sooner you book the flight, cheaper it will be”. I’m sorry but most of the times it’s not like that. The fact is that there isn’t an exact perfect period, since it will depend on the season, if there is any special event at the destination, if there is any promotional discount from the airline, etc. However according to my experience the best time to book a flight in the low season and within Europe is about 6 weeks in advance. In the high season and again within Europe I will recommend 6 to 10 weeks in advance. If you are flying to another continent I will recommend 2 to 3 months in advance in low season and extend it to 2 to 4 months if you are going in the high season. Please take in mind that this is only theoretical. In practice what I would recommend, especially for flights between different continents, is to track the price of the flight that you are interested in 5 to 6 months before your departure date. I tried this several times and I didn’t see the difference but according to several websites, such as farecompare.com, the best day of the week to buy your flight is on Tuesday at 9pm (CEST time zone). It didn’t work for me but I think it deserves a try. On the other hand I realised that booking early in the morning and avoiding weekends made the difference the few times that I tried. If you have more than one debit/credit card check the applied card fee of both. Usually debit card fees are lower than the ones applied for credit cards. 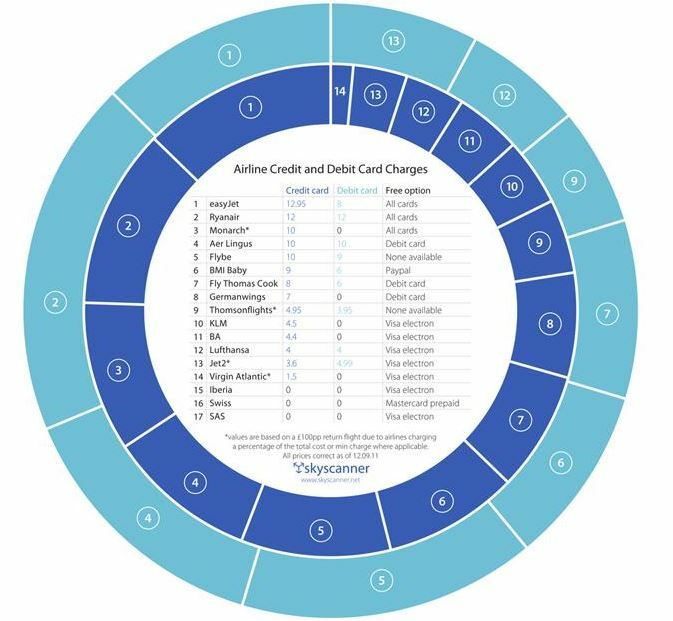 However I know that some credit cards will have no fee at all so try to ask you bank if they have these “special” credit/prepaid/debit cards for the airlines’ website that you use the most. Below you can see an example from Skyscanner about how those fees can vary according to your card and the airline website. Regarding the currency of your card I can assure you that you will always pay less if your card is in the same currency than the currency presented by the website (just because they will not apply any exchange fee and the exchanges fees applied by those websites are frequently bad). This means that every time it will be possible use a card that has the same currency as the one presented in the website. In some websites, such as Ryanair, the currency presented will be the one of the country of departure. When you pay in a different currency some websites give you the option to choose between the exchange rate of your bank and the one applied by the website. Don’t forget to check both and select the one that will give you a better rate. I know that this will sound strange but the fact is that if you just want to go abroad to have a nice time and you don’t mind to change your destination there are other tips that I recommend, like the last-minute deals or the error fares. They are all described in my post about the best websites to search for a flight, coming soon! Next Post Where to search for nice flights? The best flight finders, explained.